On Oct. 20, 2013, at 3:09 p.m., the call came to Waco police from Baylor Scott & White hospital saying a woman had been sexually assaulted earlier in the morning. Police began their investigation, and the woman identified the attacker as someone she knew, incoming football player Sam Ukwuachu, a Pearland, Texas, product who had transferred to Baylor after being dismissed months earlier from Boise State. But the many questions that seem like natural follow-ups—what did the woman say happened, what were the findings of the investigation, why did police not bring charges but a grand jury hand down an indictment—remain a mystery, even as Ukwuachu’s trial gets underway. So how does an FBS school lose a player to sexual assault charges and keep the entire thing under wraps? In Baylor’s case, keeping the situation quiet seems to have been pretty easy—just don’t mention it. And local authorities gave them some help along the way, releasing limited information and even getting a gag order from a judge. A few weeks after his dismissal, Ukwuachu transferred to Baylor and talked to the Waco newspaper about the move. He never played a down. Ukwuachu sat out the 2013 season because of the transfer, and rehabbed from pectoral surgery. But according to local reports, he was expected to play in 2014. Then August 2014 came and Ukwuachu wasn’t at practice or on the fall camp roster. By then, Ukwuachu had been indicted by a McLennan County grand jury, but reporters weren’t told about that. Instead, the culprit was “some issues” that needed to be “straightened out.” There were no reports that gave any more details about if he was eligible or not and why. Here’s all I could learn about the case before the trial. It happened at Ukwuachu’s home, an apartment in south Waco, which the woman went to willingly, police spokesman Sgt. Patrick Swanton told me. After getting the call from the hospital, Waco police detectives took a report and investigated, Swanton said, but eventually decided there wasn’t enough evidence to make an arrest. They suspended the case and turned it over to the district attorney’s office for evaluation in about mid-March. That’s the end of the information Waco PD provided. They would not give any more details of the case, like what the woman said happened that night. Swanton would not say why specifically officers felt they couldn’t make an arrest—was it due to a lack of evidence or a lack of cooperation?—or describe any of the roadblocks they hit during the investigation. I asked for copies of any incident reports that police might have taken, and Swanton told me Wednesday my request would be forwarded to the records department. Since then, nobody from the records department has called or emailed me back. I asked Swanton today if there was anyone else outside the records person I had been sent to who could help me with this request. He said no. Despite the police’s decision not to make an arrest, prosecutors brought the case before a grand jury. On June 25, 2014, the grand jury brought an indictment against Ukwuachu for two counts of sexual assault. The true bill brought by the grand jury still doesn’t give any details about what happened. That happens with true bills: the one that indicted Aaron Hernandez for Odin Lloyd’s murder was equally paltry. But in Hernandez’s case, prosecutors also spoke to the press afterward, providing information about their evidence and what they believed happened that night. In the Ukwuachu case, there appears to have been zero notice given to the media. So why did prosecutors choose to bring the case before a grand jury? Was it to avoid the messy local politics of charging a football player? Or to take advantage of a grand jury’s somewhat-secretive nature? I don’t know, and they can’t tell me. On Aug. 7, two days after the Tribune-Herald article first exposing the existence of the case, a judge granted a gag order on all the prosecutors and defense lawyers involved. Here’s the gag order, which says the motion was “presented jointly” by a prosecutor on the case as well as Ukwuachu’s defense lawyer. I asked the district clerk’s office for a copy of documentation preceding this one explaining the request for a gag order. She told me there was no other motion or document in the file, just the gag order itself. What about Baylor, the private, Christian university whose motto is “for Church, for Texas” and where Ukwuachu remains a student? Baylor, it seems, has placed a gag order on itself. I reached out to Baylor athletics communications; they deferred me to the university’s main communications department. I asked to speak to someone about what happened with Ukwuachu and how the university handled it. I got a response from Lori W. Fogleman, the assistant vice president for media communications, saying that Ukwuachu had graduated in May 2015 and subsequently enrolled in post-baccalaureate study. 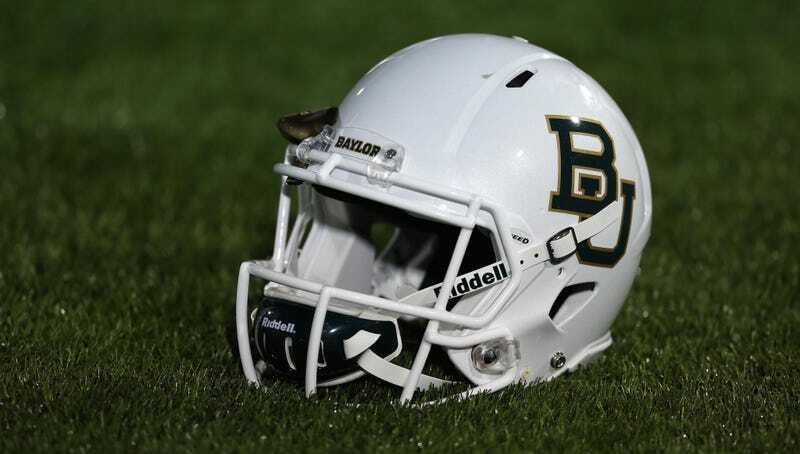 Ukwuachu’s lawyer, before the gag order, told the Waco Tribune-Herald that his client had been cleared by Baylor and was looking forward to the trial to clear his name. Nobody from the McLennan County District Attorney’s Office was quoted in the article. Here is what can be gleaned from the full court file, according to the Tribune-Herald. It’s the closest thing available to a preview of what might be presented at trial, including new details about Ukwuachu’s “personal issue” at Boise State. Prosecutors Hilary Laborde and Robert Moody have issued subpoenas for Ukwuachu’s records from Boise State and for the testimonies of a Boise, Idaho, police officer; an assistant athletic director; Ukwuachu’s former roommate; and a woman with whom he reportedly had an abusive relationship. Records from Boise State filed in the case show that Ukwuachu, who reportedly was drinking and using drugs, and the woman were involved in a dispute. Ukwuachu broke a window and cut his arm, requiring medical treatment and prompting a Boise police investigation. It is unclear from the records if that incident triggered Ukwuachu’s dismissal from the Boise State team, where he started the final 12 games as a freshman and had 35 tackles, including 16 solo tackles, and 4.5 sacks as a defensive end. Idaho court records show just one set of criminal charges brought against Ukwuachu: In 2010, he was charged with misdemeanor possession of alcohol while underage. The case was dismissed. Two days after the case became public, the same day as that the gag order was issued, coach Art Briles praised how the university handled the whole thing. The article didn’t elaborate on what Briles meant by “the way we’ve handled it.” Was he referring to any action taken by Baylor? Decisions made by his team? Or did he mean the utter dearth of information they’ve been able to maintain? His program brought in a recruit, who had been dismissed from his prior team under mysterious circumstances, and within months that player was accused of and indicted for sexual assault. On the surface, that sounds like the kind of bad news most programs dread, but Baylor has managed to keep it all out of the press until the last minute while touting its completely unknown actions as positives. The justice system will decide if Ukwuachu is guilty or not. But no matter the outcome of the case, Ukwuachu’s case has been a win for Baylor football. This is college football, after all, a government-subsidized minor league system fueled by unpaid labor, empowered by zealous boosters, and carried on the backs of mostly unattainable dreams. It’s a product, and like any sales campaign, it’s only the optics that matter.